Even if you want to shut the door, it opens with a little push. Even if the ship is about to sink, it turns with a move of the pole. when the boat is about to sink, one stroke of the oar and it turns. The canyon enters the valley -- there's no way of return. The Senkatsu Peak soars to heaven: [only] one hole is open. The peaks cross the sky -- there is a gateway. Just tell me, where does it go? Shushan Kuangren came to Guishan Daan and asked, "I have heard that you said, 'Words of being and words of non-being are just like wisteria wound around a tree.' If suddenly the tree falls down and the wisteria withers, where will the words go?" Guishan burst into great laughter. Shushan said, "I sold my clothes and other belongings, and made an arduous journey of four thousand li* to come to you. [or: "I came four thousand li, selling cloth mats."] Why does Your Reverence make light of me?" Guishan called his attendant and said, "Bring some money and give it to this reverend monk for his travel expenses." Finally he said, "Some day a one-eyed dragon will let you open your eyes." Later Shushan went to Mingzhao and told him about this. Mingzhao [who was blind in one eye] said, "I can say that Guishan is completely right, but he did not meet one who could appreciate him." 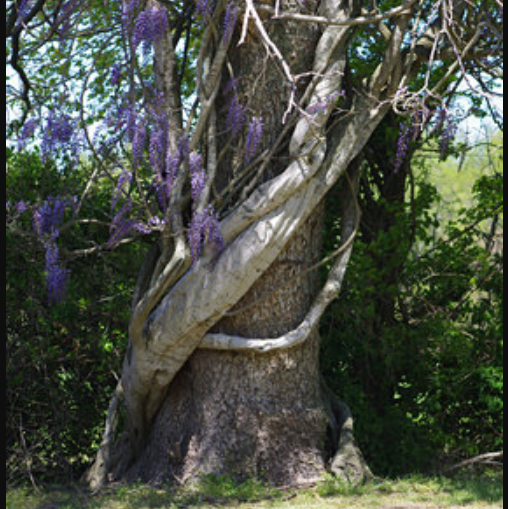 Shushan asked again, "If the tree falls down and the wisteria withers, where will the words go?" Mingzhao said, "It would make Guishan laugh again all the more." Upon hearing this, Shushan gained realization. Then he said, "From the beginning, there was a sword behind Guishan's laughter." *The length of a Chinese li has varied over time. Today, a li is fixed at half a kilometer. During the Tang dynasty, a li was 323 m, so 4,000 li would have been 1,292 km (803 miles) -- about the distance from Portland, ME to Raleigh, NC. A vine withers, a tree falls, and Guishan is asked. The great laugh -- Ahhaahhaa! -- is not to be made light of. Big laughter, ha! ha! -- is it indeed casual? Clearly see that within the laugh there is a sword. In the laugh there is a sword -- he sees through it. Word and thought have no road -- gone are all machinations. Shushan Kuangren called on Dongshan and asked, "Please teach me the word that doesn't yet exist." Dongshan said, "When you don't consent, no one agrees." Shushan said, "Should one take care of it?" Dongshan said, "Can you take care of it now?" Shushan said, "If not, there's no place to avoid." Later, Shushan was in the assembly of Xiangyan Zhixian (d. 898). A monk asked Xiangyan, "How is it when not looking up to the sages and not esteeming one's own spirit?" Xiangyan said, "Myriad impulses cease; even the sages don't accompany you." Shushan, in the assembly, made a spitting sound and said, "What kind of talk is this!" Xiangyan siad, "You don't agree with me?" Shushan came forth from the assembly and said, "That's right." Xiangyan said, "Can you speak?" Xiangyan said, "Try to say it." Shushan said, "If you would have me speak, you must take the role of student." Xiangyan then got down from the seat and bowed to Shushan, then pursued the preceding question. Shushan said, "Why not say 'Consent and agreement can't be complete'?" Xiangyan said, "Agree to what? Consent with whom?" Shushan said, "Agree with the sages, consent with oneself." Xiangyan said, "Even granting you this, still you'll be vomiting for thirty years; even if you live on a mountain, you won't have any firewood to burn, and even if you live by a river you won't have any water to drink. Remember this clearly." Later, he lived on Shushan (Mt. Shu), and it turned out as Xiangyan had predicted. After twenty-seven years his illness disappeared; he said to himself, "Xiangyan predicted that I'd vomit for thirty years. Now I'm three years short." After every meal he'd stick his finger down his throat and vomit, to accord with Xiangyan's prediction. Shushan later asked Zen Master Qingjing Daofu, "Agreement can't be complete -- how do you understand?" Qingjing said, "It goes back completely to agreement." Shushan said, "What about 'can't be complete'?" Qingjing said, "Here there is no way of agreement." Shushan said, "You've finally got this sick monk's idea." My path is beyond the blue emptiness. White clouds have no place to flow. The yellow leaves are sent back by the wind. I'm not saying Shushan didn't have a particular strong point besides, but he broke the precepts, broke up the turning of the wheel of Teaching and broke the harmony of the community; this had to evoke manifest results: Xiangyan's prophecy and Shushan's forced vomiting to accord with the prophecy were both making examples for people of later times. Shushan was also an unfathomable man of high spiritual rank. This koan appears as one of the Eight Difficult Koans of Hakuin Zenji. “Words of being and words on non-being” -- Because there is being, there is non-being, and vice-versa. It is just like the wisteria winding around the tree. In like fashion, you cannot separate being and non-being from each other. The same holds for life and death. To say that the tree and the wisteria wither means to suddenly realize that the content is completely empty. It means realizing emptiness. It means realizing that subject and object are both empty. Shushan asks where such ideas as being and non-being, life and death, good and evil, right and wrong go at such a time. Guishan's laughter was a sword cutting away all concepts. We are usually only aware of the world of phenomena. The natural world appears as an object of sensation. Although there is definitely that phenomenal world, from another standpoint it is completely empty. Moreover, the world of emptiness and the phenomenal world are completely one. If I use the example of my own hand, we can see the back of my hand as the phenomenal world. But when I open up my hand like this, we see the palm. That is the world of not one thing. I have a right hand and a left hand. To all appearances they are separate and two. But these two hands are living my same single life. We can say the same thing about everything in the universe. Guishan’s laughing is the whole universe. That laughing in the phenomenal world is, as it is, the entire universe. It exhausts the entire universe. Unless you understand that, you cannot understand this koan. The true reality is that the essential world and the phenomenal world are one. Shushan made an arduous journey to question Guishan Daan: he walked four thousand li on foot. He had sewn and sold cushions to sustain himself along the way. He made this great pilgrimage because he had this question burning in his gut. When walking next door to see the neighbors we should have the same resolve as Shushan. Even though he was a high-maintenance and difficult rscal, Uncle Dwarf's mind always was on realizing the truth. Where is your mind when you go to visit the neighbors? To be with or without words, still you're clinging to words. When everything you rely on, when everything you depend on falls away, then what? When your health, your means of financial support, your friends, and your family fall away, then what? When you've lost everything you hold dear, to where do you return? It's quite an important, serious question -- and Shushan has journeyed far to ask it. Yet Guishan just gives Shushan a hearty belly laugh! Guishan wasn't laughing at Shushan -- he was just laughing! "From the first, Guishan's laughter had a sword!" Finally, Shushan saw not only the intent of Guishan's laughter, but the content of Guishan's laughter. That laugh was the very expression of what everything returns to when everything falls away. but the lesson he learned, surprising to say? – is that selling cloth mats is what’s really okay. carried in by the evening tide. To bloom purple, and seed. Supports and feeds its ontological categories. And if that tree collapses?